Formula that helps transform any mistake into a smudge-free nail finish. 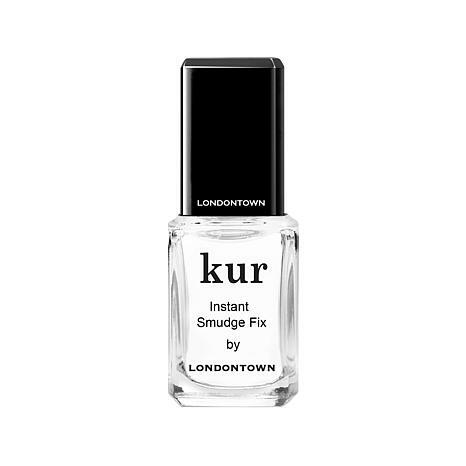 - Gently brush a thin layer of kur Instant Smudge Fix over entire nail to smooth polish. - Allow the layer to dry for ten seconds. - Apply kur Protective Top Coat or kur Gel Genius Top Coat. - Wait two minutes and apply one drop of kur Accelerating Drying Oil. - Fill in ruined area with polish and allow it to dry for ten seconds. - Allow the layer to for ten seconds. - If desired, apply kur Protective Top Coat or kur Gel Genius Top Coat. I have been buying this product from HSN for about 4 years now and trust me, if you do your own nails, this is a must have. When (and I always do) I touch anything after a fresh nail polish, this fixes it totally. Even nails that mess up overnight can be corrected with this polish. Great price, great line of products, please never let this go away. Professional salons need this instead of rubbing nail polish remover to correct a smudge when this works so much better without removing the undercoats you already have on when correcting a mistake. Stocked up for the coming holidays! Bottle also last a long while, does not dry out. Highly recommend this line, love them all including the quick drying oil drops. Fixes chips in a jiff. This fixes the chips up and you can't tell there was any chips. It dries fast and makes the manicure last longer. I have used only a few times but so far I have gotten about 3 days wear from when I applied it after my nails chipped. I did some cleaning and only got a minor chip on the end and my manicure still looks great. Love this product. Use it with every manicure. Would not be without it. This does just as it is called. After painting nails, get a smudge, a little of this makes it go away, easy fix. Highly recommend for any polish you use. Great product. Great product.. Works as claimed..